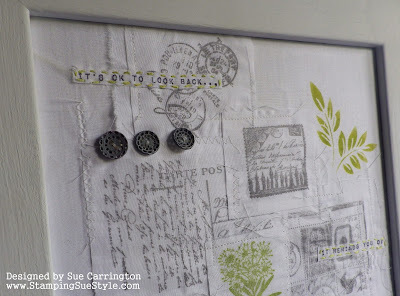 I'm sharing an Inspirational post over on the Stamps and Stencils blog today. 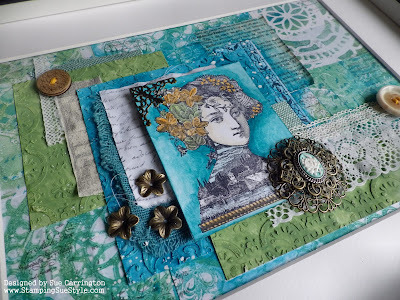 Lots of Gelli printing for this project which was great fun ! 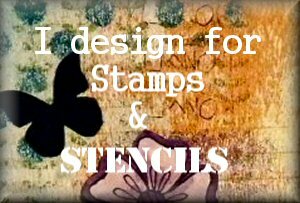 For all the details you'll need to hop over to Stamps and Stencils. 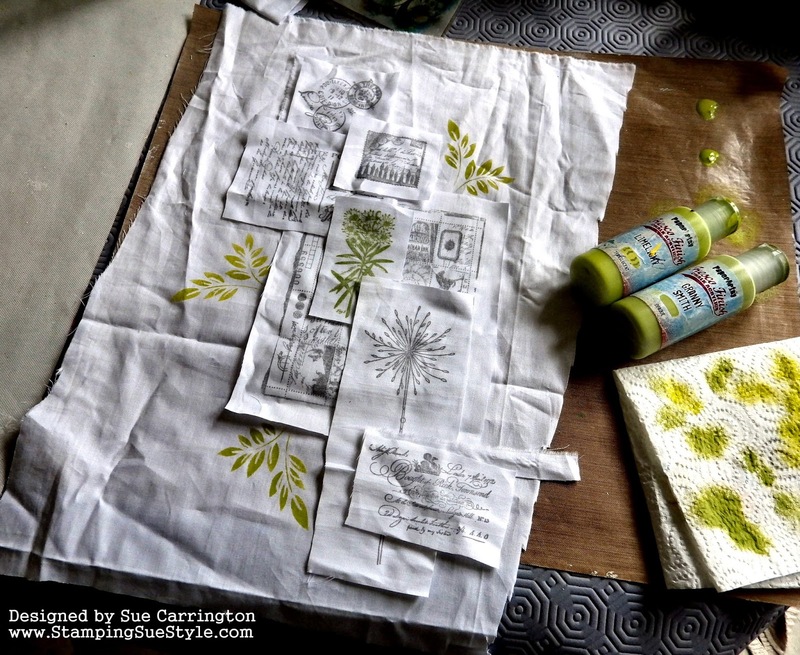 I'm over on the PaperArtsy blog tonight with a project using the new Seth Apter paints. 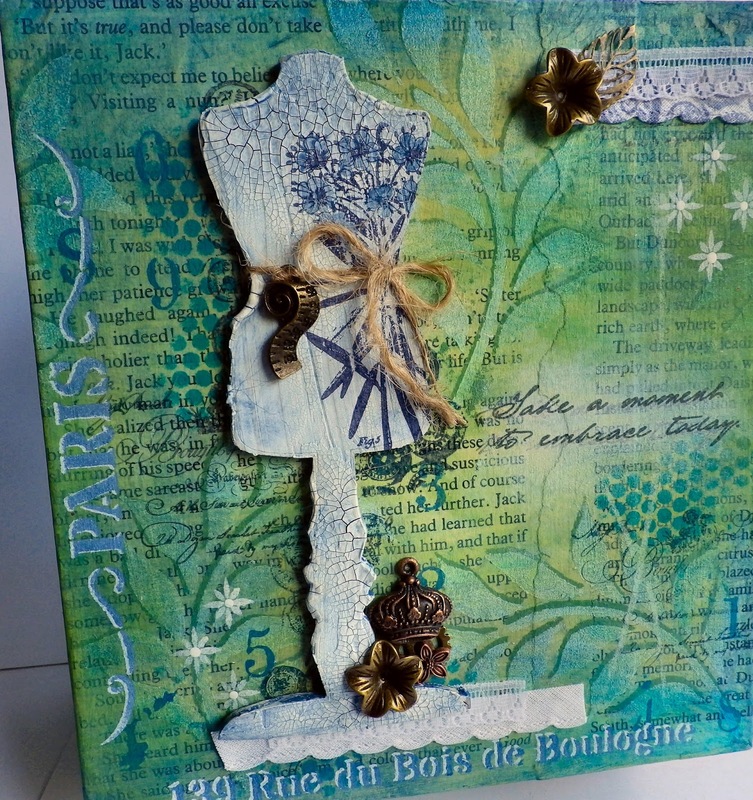 Loved using these colours, for all the details you'll need to hop over to the PaperArtsy blog. 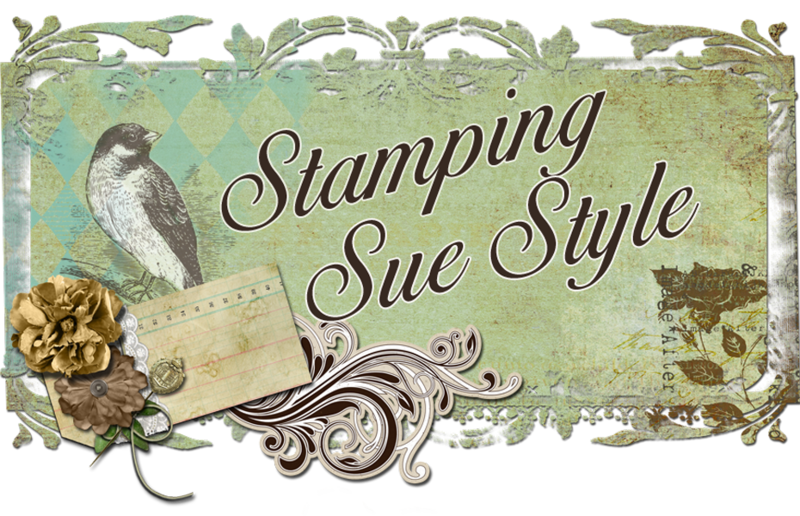 We're kicking off the new challenge over at Stamps and Stencils and the lovely Cec is our hostess. No I am not sending you to school but thought it might be fun this month to make a collage. You can use any substrate such as canvas, corrugated cardboard, wood, or canvas boards for instance and add any items to it as long as you include some stamping and/or stencilling. I love creating projects along this theme so the hardest part was to make a decision on the final design. I've recently decorated my bedroom and had been thinking that I needed a piece of art for the wall so this was my chance ! I am well and truly hooked on the colour (shade) of grey at the moment and as I've painted my bedroom a shade of grey then this is where the planning all began. I stamped several images all from PaperArtsy stamp sets with Watering Can Arhcival ink onto Egyptian cotton. The other colour that I am automatically drawn to is green and all the shades there of. 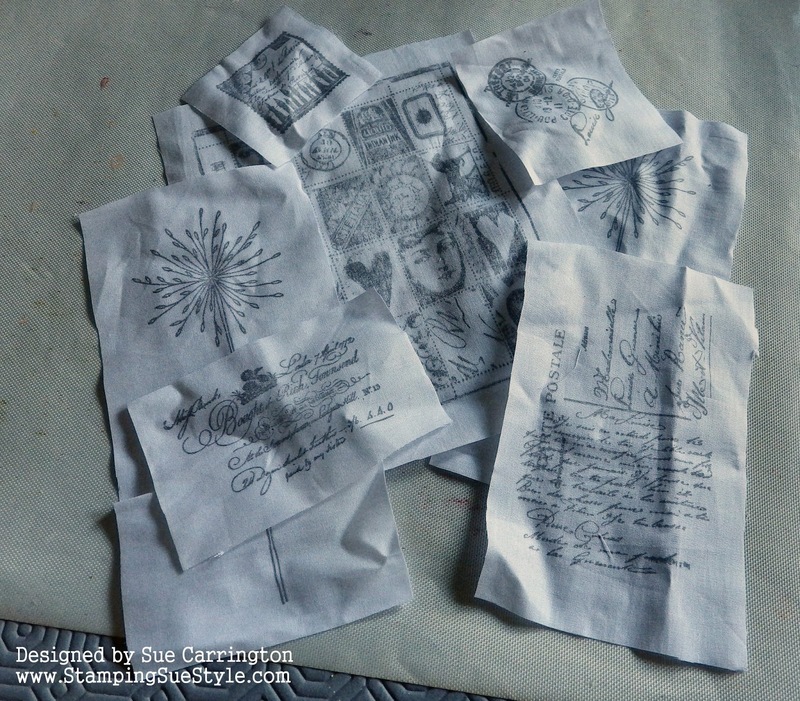 I used a larger piece of Egyptian cotton as the base and laid out my images. The frame I wanted to use was a dingy brown colour so I used one of the tester pots left over from my decorating and gave it 3 coats. This then enabled me to use the frame while I was planing the layout, to make sure it would all fit in. 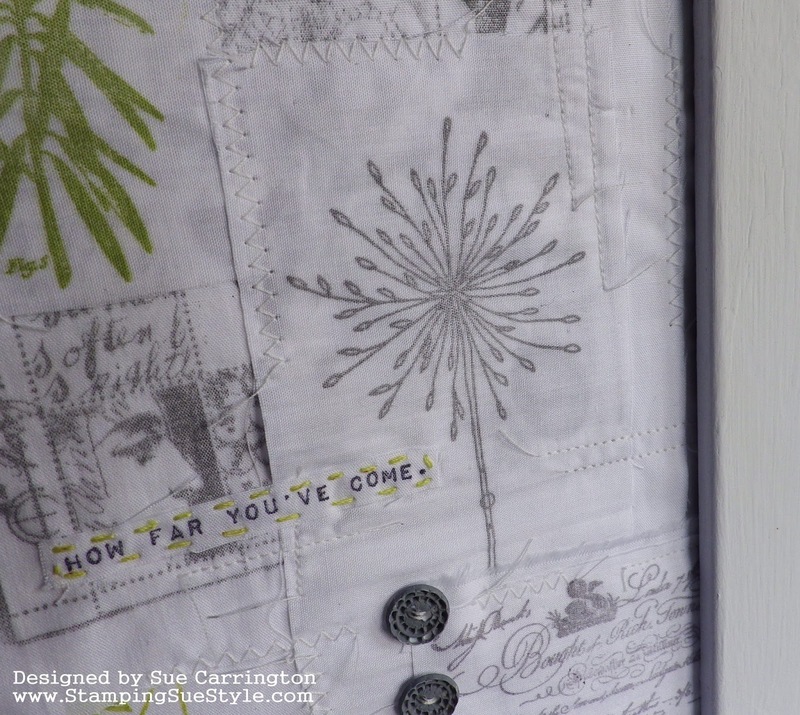 All of the collage elements are sewn on to the back piece before glueing them with Pinflair book binding glue to the back board of the frame. I wanted to keep the whole piece really delicate so only touches of shades of green and grey. The sentiment is one of Wendy Vecchi's, stamped onto Egyptian cotton then cut into strips. 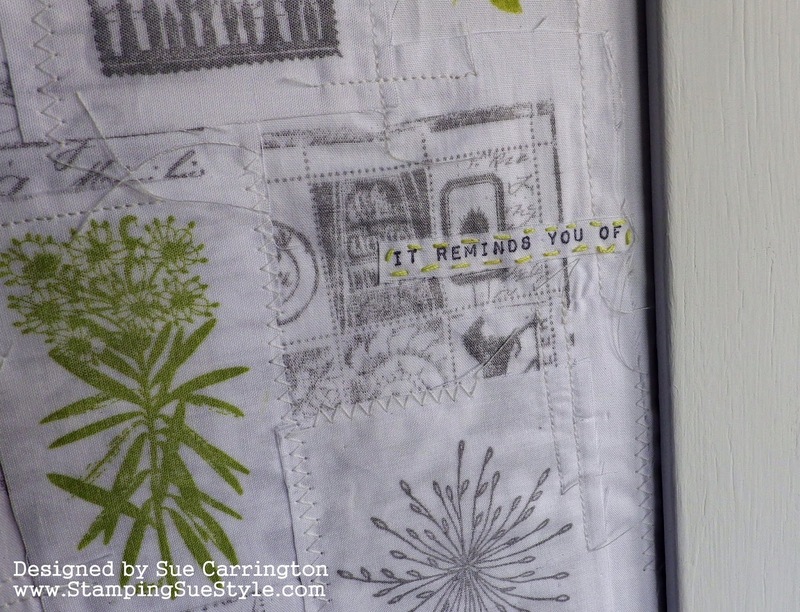 I found some green thread and jsut did a simple running stitch to attache the strips. The main image that creates the background is by Lynne Perella and is a collage of different images in it's own right. 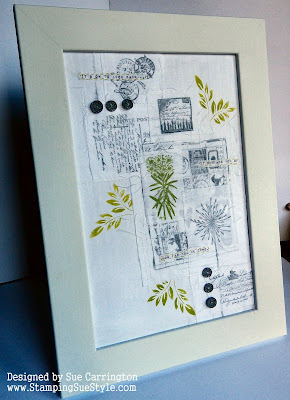 I loved how this Kay Carley image came out, it's stamped so clearly onto the fabric and is so delicate it fits right in. 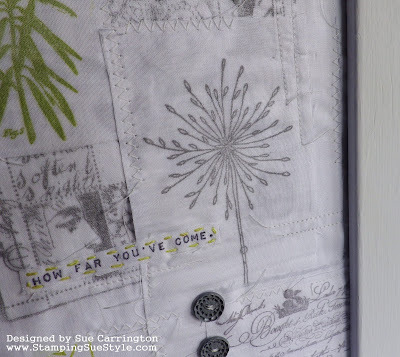 The leaves are stencilled onto the backing piece using a Wendy Vecchi stencil and Fresco Finish Chalk Acrylics and the buttons are painted with with Fresco paints to blend in. 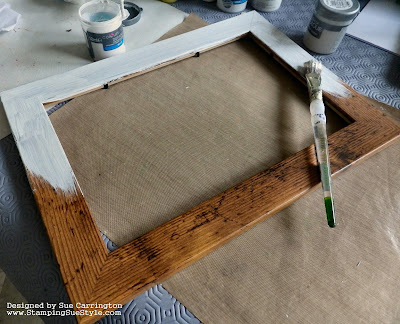 I've got the place already lined up where this is going to hang, all I need is a hammer and a hook ! I hope you can join us for this challenge, the rest of the DT have created some fabulous projects for your inspiration so do make sure you hop over to the Stamps and Stencils blog.